Who doesn’t love a rich and hearty soup that’ll warm you up from the inside out? Embracing the local harvesting season, using fresh seasonal heirloom carrots I got at the farmers market, I decided to create a Thai inspired Coconut Carrot soup. Bursting bright orange in colour, rich in beta-carotene, a precursor of Vitamin A with subtle undertones of decadent rich coconut milk. 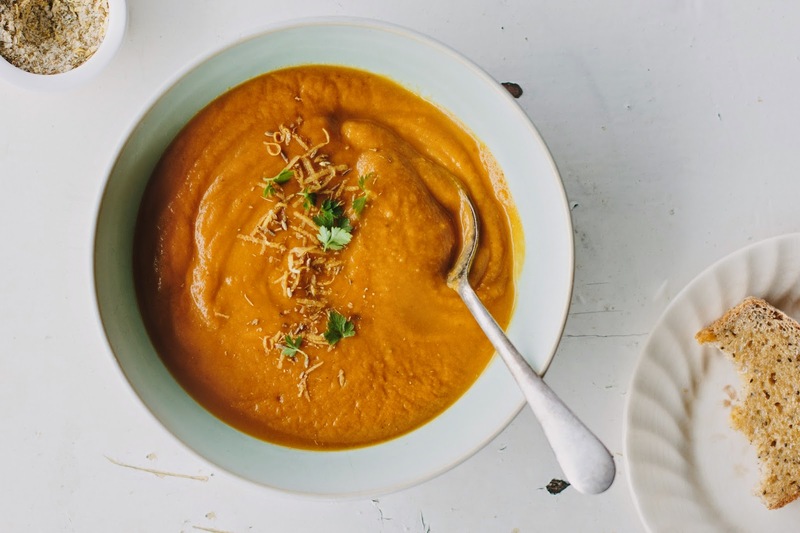 Try fasting on this gut-loving, dairy-free Thai Coconut and Roasted Carrot Soup, recipe from Gut Gastronomy written by Vicki Edgson & Adam Palmer. 2. Roast carrots and coriander seeds for 30 minutes until golden brown. 3. Fry onion, ginger, garlic, lemongrass, chilli, celery and lime leaves in coconut oil until softened on low to medium head. 4. Add carrots and coriander seeds into pan, pour in chicken broth and coconut milk. Bring to simmer and cook gently for 15 minutes. 5. Remove lime leaves and add cilantro. Blend until smooth using a blender. Season with salt and pepper and add lime juice. Pass through fine sieve. 6. Ladle into soup bowls and serve. Jollia is passionate about nutrition, crazy about whole foods, and is always on the hunt for healthy recipe inspirations. She’s also the blogger at RosyCheeksProject where she writes about optimal gut health and shares her favourite gut-healthy recipes. You can catch her in action on Instagram (@rosycheeksproject) or see what’s brewing in her kitchten at RosyCheeksProject.com.